In California’s Central Valley, millions of dollars’ worth of almonds, walnuts, and pistachios are disappearing without a trace, said journalist Peter Vigneron. Who’s behind the heists? The nut thefts are quick and professional, and often involve fake trucking companies. AT 11:22 A.M. on Thursday, June 20, 2013, an orange Freightliner tractor trailer arrived at Crain Walnut Shelling in Los Molinos, Calif. The truck’s driver, a man in his mid-30s wearing a gray T-shirt, introduced himself as Alex Hernandez. He said he was from K and G Transport Services, a company contracted to take a load of Crain’s walnuts to Bulk Barn Foods Limited, a Canadian food retailer located 2,600 miles away in Ontario. Hernandez had arrived before the pickup had been scheduled, which initially made Crain’s logistics director suspicious. But after double-checking the paperwork that he provided, she directed employees to load 630 cartons of walnuts, worth $85,000, into Hernandez’s trailer. At 12:06, Hernandez left Los Molinos and headed south through California’s Central Valley into Glenn County, where he picked up a second batch of walnuts from a processor called Carriere Family Farms. By Monday, June 24, neither batch of walnuts had arrived in Canada. A representative from the shipping brokerage tried but failed to reach K and G, and alerted Crain to the possibility that the nuts had been stolen. On June 27, Chad Parker, a then-38-year-old agricultural-crimes detective with the Tehama County Sheriff’s Office, went to investigate. Crain’s chief financial officer showed Parker a photograph from June 20 and provided him with the Freightliner’s plate number and a photocopy of Hernandez’s commercial driver’s license. What Parker found made little sense: The plate came back registered to a different model of truck, and the license number belonged to a 30-yearold woman. Later, when Parker pulled records for the phone number Hernandez had listed on the paperwork, he found that it was a prepaid cellphone with a Miami area code. It had been activated for the first time only two days before the pickup and then disconnected on June 29. Tractor trailers do not disappear easily, and Parker considered issuing a be-on-the-lookout for the Freightliner. But more than a week after the theft, he decided it was likely long gone. 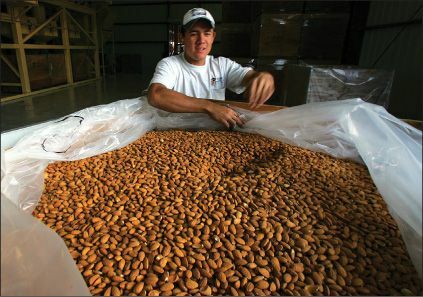 AROUND THE TIME of the Crain theft, Rich Paloma, a police officer turned reporter at The Oakdale Leader, a weekly paper based several hours south of Tehama County, began tracking high-value loads of nuts that had vanished. Paloma counted half a dozen heists, valued at more than $1 million, in the previous year. In the fall of 2013, he published an article speculating that the thefts were coordinated. In recent years, nut theft has exploded into a statewide problem in California. More than 35 loads, worth at least $10 million, have gone missing since 2013. The number and style of the thefts—quick and professional, as if the characters from Ocean’s Eleven had descended on the Central Valley—have drawn the attention of federal organized- crime investigators and prompted the creation of a regional task force. Why steal nuts? They’re worth an awful lot of money. In 2014, the American Pistachio Growers association reported industrywide sales of more than $1.6 billion. The organization recently signed endorsement deals with British cyclist Mark Cavendish, big-mountain snowboarder Jeremy Jones, and the U.S. water polo teams. California grows the majority of the world’s almonds and is the second-largest producer of pistachios and walnuts. Many environmentalists blame their cultivation for exacerbating California’s drought—nut trees are thirsty plants. The man tasked with finding missing nuts in Tulare County is Sheriff Mike Boudreaux, and in 2015 he faced a growing problem. That year, thieves had stolen six shipments, valued at $1.6 million, from area processors, including Horizon. Recognizing a threat to the county’s economy, Boudreaux assigned half a dozen detectives to a new unit: the Nut Theft Task Force. I met most of them at a conference for nut processors in Modesto last year. The men were barrel-chested and serious, wearing jeans, cowboy boots, and blousy white dress shirts. They looked as if the department had just then switched their assignment from bailing hay to organized crime. THE CLOSER CHAD Parker looked at K and G Transport, the more he grew convinced that the Crain theft was linked to a broader conspiracy. E-mail records for K and G revealed that someone had been accessing the company’s account from public computers at libraries and internet cafés around Los Angeles. (K and G is based in Miami.) Cargo thieves often pose as legitimate companies and bid for shipping contracts on load boards, which are sort of like Craigslist for truckers looking for jobs. A thief hoping to steal almonds might try to find transport jobs in nut-growing regions across the country, especially ones that ask truckers to be well insured or that leave late in the week, to give them a few extra days to get away. The Crain pickup, which occurred on a Thursday and was headed to Canada, was a perfect target. Parker’s first real break came when he discovered that Hernandez had made an error: Crain employees asked him to submit a thumbprint on June 20, 2013, and he agreed. Parker was shocked when the thumbprint generated a hit in the California Department of Justice database. Hernandez, it emerged, was actually a parolee named Marco Alberto Garcia, and he had recently been detained in the Los Angeles County Jail. Parker subpoenaed cellphone records for Garcia’s contacts, many of whom seemed to live and work in L.A. When interviewed, however, Garcia refused to answer any questions, and Parker wasn’t optimistic about the case. “It went cold pretty fast,” he told me. To help navigate the Los Angeles connections, Parker had sought out Marc Zavala, an LAPD detective who is widely regarded as the state’s top cargo-theft investigator. I met Zavala at a Starbucks in Van Nuys last year to discuss the crisis. These people “know that the punishment for theft is nothing. There’s minimal jail time,” usually measured in weeks or months, he told me. California grows the majority of the world’s almonds. Zavala put me in touch with a truck driver I’ll call Andrei, whom he arrested several years ago. I met Andrei last summer in Commerce City, Colo., east of Denver. He is 53 and short, and was wearing sandals, a baseball hat, shorts, and a blue buttondown shirt open to his belly. Andrei is ethnically Armenian and lived in the Republic of Georgia before emigrating in 1995 to the Los Angeles area, where he did occasional work with a small trucking company. In 2011, an accident put Andrei’s truck out of commission. 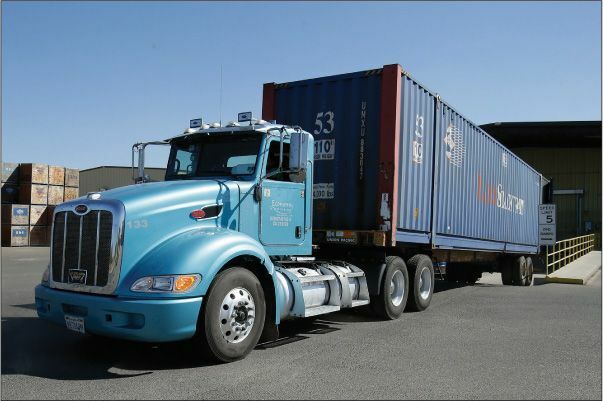 He needed money and approached a friend in the trucking business for help. The man had easy access to federal motor-carrier and Department of Transportation ID numbers. “We’re going to put these stickers on your truck, because they know this company,” he told Andrei. The man gave him a fake driver’s license and a new truck, and then sent him to collect a load of Budweiser. After Andrei delivered the beer successfully, the man had him steal a trailer full of beauty products. Investigators call these schemes “fictitious pickups,” and they are a variation on the style of theft used in the Crain and Horizon heists. The idea is to convince victims that they are working with legitimate truckers— sometimes by making up a trucking company, sometimes by faking the paperwork of a legitimate business. Zavala happened to catch Andrei as the beauty products were being unloaded, and then linked him to a 2011 almond theft in Madera, Calif., from a processor called Going Nuts. Andrei told me he collected the load of almonds from Going Nuts as a subcontract while passing through Northern California on a run back to Los Angeles. He took them to a warehouse in Van Nuys, where two men—one of whom had an Israelisounding accent—paid him $600 cash. According to a criminal complaint in the case, the almonds were intended for Once Again Nut Butter in Nunda, N.Y., but never arrived. Zavala believes that they ended up in Mexico. Andrei’s lawyer advised him to plead guilty to stealing the almonds. He spent just shy of a month in jail and is now back to work as a driver. It appears that some drivers are genuinely unaware that they are participating in a crime. Kirk Squire at Horizon believes that a gullible driver picked up the company’s pistachios, not knowing he was delivering them to criminals. In his experience, he says, “it’s always been a subcontracted driver who doesn’t know what’s going on.” Keeping drivers in the dark makes it significantly harder for police to trace missing nuts— theft on a need-to-know basis. Andrei and I spoke at dusk in the parking lot of a shipping facility in Commerce City. The area was a warren of warehouses, empty lots, and tractor trailers. Andrei was likable and friendly, though midway through our conversation he mentioned that he fought with Soviet forces in Afghanistan in the 1980s. This revelation was not intended to be threatening, but it did nothing good for my nerves. After we spoke, Andrei said he was scheduled to haul a load of coins from the U.S. Mint in downtown Denver back to L.A., a detail I found astonishing, given his prior convictions. Excerpted from an article that originally appeared in Outside. Reprinted with permission.